Decoupage is a great craft project for children. Decoupage for kids is a fun way for children to explore their creativity. Very few supplies are needed and most projects can be completed in a fairly short period of time. The term decoupage refers to the practice of covering an object with paper cutouts and using a special adhesive coating such as Mod Podge to protect and seal the finished design. Decoupage remains a very popular craft among people of all ages because it's a great way to recycle old items or give inexpensive pieces a fashionable, one-of-a-kind look. Dollar stores, discount stores, thrift shops, and garage sales are all excellent sources of materials for decoupage projects. For more great decoupage project ideas, check out Every Kid Needs Mod Podge, a fun activity book by Candice and Richard Elton. Depending upon the project and the age of the crafter, buttons, charms, ribbons, rhinestones, glitter, and other embellishments may also be used to add interest to a decoupaged item. Decoupage for kids is a simple craft, built on the skills of cutting and pasting. Cut out the images you plan to use for your project. Play with the placement of the images until you are happy with the design. Working from left to right and top to bottom, adhere the images with a thin coat of Mod Podge applied with a foam paint brush. Use a popsicle stick to smooth out any air bubbles. When all the images are adhered, apply a thin coat of Mod Podge over the top of the top of the project to seal and protect your work. After the project is entirely dry, add a second layer Mod Podge. Add buttons, charms, or other dimensional embellishments if desired. Set up your work area and read all of the directions for the supplies you plan to use before you begin. Children are notorious for their short attention spans, so you want to make the experience run as smoothly as possible. Kids can be messy when crafting, so you want to cover your work surface with an old sheet and move any valuable or fragile objects into another room. 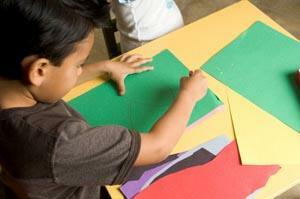 In most cases, Mod Podge with a matte finish is easier for a child to work with. Gloss or lustre finishes show brush marks, fingerprints, and air bubbles more easily. If you're working with a child who is too young to cut detailed images for the project, encourage him or her to simply rip strips of colorful paper to use as decoupage material. The effect is a bit more abstract, but much less likely to cause unneeded frustration.